You may control what character encoding to use on export. Usually one of ISO-8859-1 or UTF-8 would be most appropriate (at least in western or central Europe). While "List all?" isn't checked, the choice list will only offer you about six of the most common character sets. But by enabling "List all?" you will be offered several dozens of encodings, i.e. all your Java version will know of. 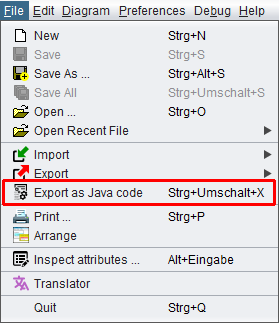 With export option Favorite Code Export you can select the target code for that menu entry and accelerator key. If you confirm with Yes then this will have the same effect as if you had chosen the new "Favoured Code Exort" here in the Export option dialog. As soon as you export to a different language, the counting starts again from 1. Though Nassi-Shneiderman diagrams are basicly syntax-free and rather rely on structure, some Structorizer features like Executor and Analyser accept and work with a (somewhat eclectic) HLL syntax, aspects of which are described in the Syntax page. Consequently, Code generators also derive the target code under the assumption that instructions and expressions are written in that executable and analysable Structorizer dialect. This causes of course trouble if the text contents of the diagram elements have already been written in the syntactical conventions of the intended target language. In this case, Structorizer would spoil the readily prepared text on export, trying to convert it again under false assumptions. So if you work and document explicitly for one favourite language and used to fill in the element texts already according to the specific target language syntax then you may activate this checkbox, causing only the structural (and closely related) conversions but no (or only minimum) translation of the instruction lines, conditions etc. It is a kind of "raw export", particularly valuable for dedicated shell script development (because shell syntax is practically incompatible with HLL syntax conventions). If this option is enabled then the code of Instruction, Call, and Jump elements will be exported as mere comments. (Otherwise a conversion or translation to the respective target language will be tried; see also "No conversion of the expression/instruction contents" above). This option is related to the code style of compound instructions in C-like languages. If the option is activated then blocks will start (i.e. the position of the opening brace) at the end of the commanding line, e.g. BASIC (Beginners' All-purpose Symbolic Instruction Code) has developed numerous dialects from the very beginning. There are worlds between the first versions (about 1970ies) and some modern derivates with object-oriented enhancements etc. that hardly remind "good" old BASIC at all (Microsoft VisualBasic may serve as an extremely drifted-away example). So it's nearly impossible to refer to BASIC as a specific language. Correspondingly, a code export to "BASIC" is somehow a joke. We try it nevertheless. the ancient types with mandatory line numbers and very restricted subroutine support ("typical" BASIC), e.g. and some more up-to-date style without line numbers, but with some generalised variable declarations via "dim ... as ..." etc., e.g. If this mode is active and your diagram to be exported contains Call elements then the code generator looks for available matching diagrams (in the Arranger) and includes their code into the export. This way, if all required subroutine diagrams are found, the generated code will contain all necessary routine definitions to get the code runnning (after the usual manual post-processing). This option applies to all languages offered for export. The subroutine dependencies are analysed and a topological sorting is attempted, i.e. the code of subroutine precedes that of its caller. Most compilers require this order. (Be aware, though, that the resulting code for e.g. BASIC with also switched-on line numbering may be dysfunctional because the numbered lines do not easily allow the insertion of larger bunches of code from a different place). If this mode is active (the default) then metainfo introduced with version 3.26-06 (name of the creator and last modifier of the diagram as well as the corresponding dates, license name and text as configurable with the Saving preferences) are also written as comments into the exported code. Otherwise they will not. Note that these include options will only be considered in interactive mode, in batch export mode they will be ignored. Further options may be added on user demand.